, a strenuous champion for the Calvinism of the church of England, was born | at Farnham, in Surrey, Nov. 4, 1740. His father was Richard Toplady, esq. a captain in the army, and his mother, Catharine Bate, sister to the late Rev. Julius Bate, and to the rev. Mr. Bate, rector of St. Paul’s, Deptford,by whom they were married, at the said church, on Dec. 31, 1737. They had issue one son, Francis, who died in his infancy, and afterwards the subject of our memoir. His godfathers were Augustus Middleton, and Adolphus Montague, esqrs. ; in respect to whom, he bore the Christian name of the one, and the surname of the other. His father died at the siege of Carthagena, soon after his birth. 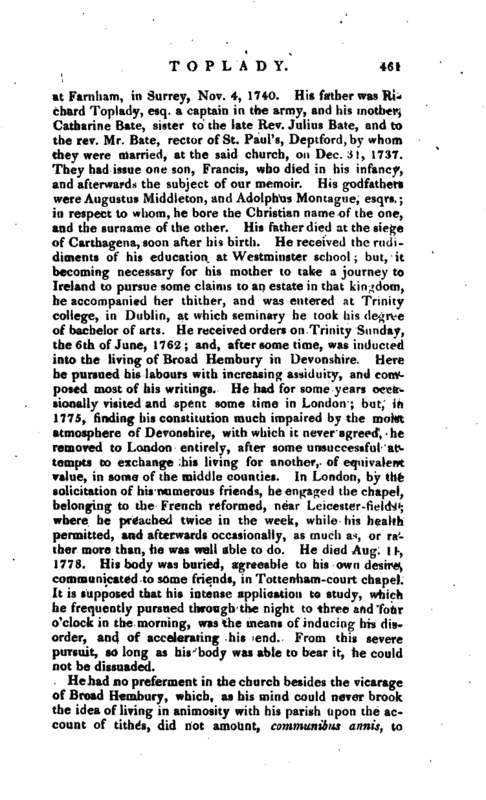 He received the rudidiments of his education at Westminster school; but, it becoming necessary for his mother to take a journey to Ireland to pursue some claims to an estate in that kingdom, he accompanied her thither, and was entered at Trinity college, in Dublin, at which seminary he took his degree of bachelor of arts. He received orders on Trinity Sunday, the 6tli of June, 1762; and, after some time, was inducted into the living of Broad Hembury in Devonshire. Here he pursued his labours with increasing assiduity, and composed most of his writings. He had for some years occasionally visited and spent some time in London; but, in 1775, finding his constitution much impaired by the moist atmosphere of Devonshire, with which it never agreed, he, removed to London entirely, after some unsuccessful attempts to exchange his living for another, of equivalent value, in some of the middle counties. In London, by the solicitation of his numerous friends, he engaged the chapel, belonging to the French reformed, near Leicester-fields; where he preached twice in the week, while his health permitted, and afterwards occasionally, as much as, or rather more than, he was well able to do. He died Aug. 11, 1778. His body was buried, agreeable to his own desire, communicated to some friends, in Tottenham-court chapel. It is supposed that his intense application to study, which he frequently pursued through the night to three and four o’clock in the morning, was the means of inducing his disorder, and of accelerating his end. From this severe pursuit, so long as his body was able to bear it, he could not be dissuaded. He had no preferment in the church besides the vicarage of Broad Hembury, which, as his mind could never? brook the idea of living in animosity with his parish upon the account of tithes, did not amount, coinmunibus annis, to | eighty pounds a year. For this living he exchanged another, not far distant from it, which had been procured for him by his friends in a mode which (though usual enough) his conscience could not approve; and therefore, when he became acquainted with the manner of their diligence, which was not for some time afterwards, he could not rest satisfied till he had parted with it. His publications were, 1. “The Church of England vindicated from the charge of Arminianism; and the case of Arminian Subscription particularly considered; in a Letter to the rev. Dr. Nowell,” 1769. 2. “The Doctrine of absolute Predestination stated and asserted; with a preliminary discourse on the Divine Attributes: translated in great measure, from the Latin of Jerom Zanchius; with some account of his Life prefixed,” 1769. 3. “A Letter to the Rev. 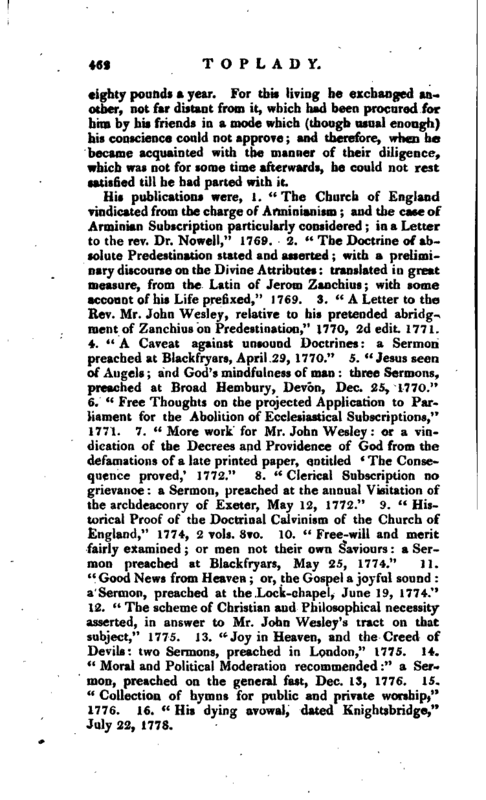 Mr. John Wesley, relative to his pretended abridgment of Zanchius on Predestination,” 1770, 2d edit. 1771. 4. “A Caveat against unsound Doctrines: a Sermon preached at Blackfryars, April 29, 1770.” 5. “Jesus seen of Angels; and God’s mindfulness of man: three Sermons, preached at Broad Hembury, Devon, Dec. 25, 1770.” 6. “Free Thoughts on the projected Application to Parliament for the Abolition of Ecclesiastical Subscriptions,” 1771. 7. 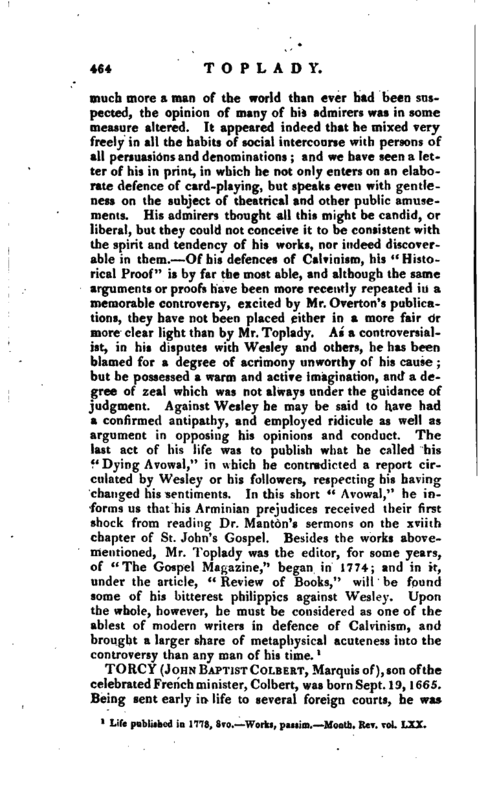 “More work for Mr. John Wesley: or a vindication of the Decrees and Providence of God from the defamations of a late printed paper, entitled ‘ The Consequence proved/ 1772.” 8. “Clerical Subscription no grievance: a Sermon, preached at the annual Visitation of the archdeaconry of Exeter, May 12, 1772.” 9. “Historical Proof of the Doctrinal Calvinism of the Church of England,” 1774, 2 vols. 8vo. 10. “Free-will and merit fairly examined; or men not their own Saviours: a Sermon preached at Blackfryars, May 25, 1774.” 11. “Good News from Heaven or, the Gospel a joyful sound a Sermon, preached at the Lock-chapel, June 19, 1774.” 12. “The scheme of Christian and Philosophical necessity asserted, in answer to Mr. John Wesley’s tract on that subject,” 1775. 13. “Joy in Heaven, and the Creed of Devils: two Sermons, preached in London,” 1775. 14. “Moral and Political Moderation recommended” a Sermon, preached on the general fast, Dec. 13, 1776. 15. “Collection of hymns for public and private worship,” 1776. 16. 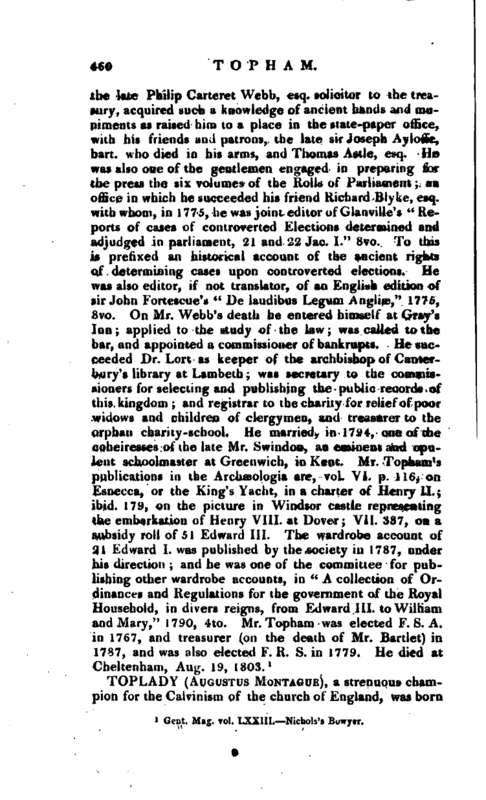 “His dying avowal, dated Knightsbridge,” July 22, 177S. | Since his death, a complete edition of his Works has been printed in 6 vols. 8vo, besides a volume of posthumous pieces, concerning the authenticity of which some doubts had been entertained, but these were removed by a letter from his executor, Mr. Hussey of Kensington, to whom he gave permission to publish them. How far this was done with judgment has been doubted. 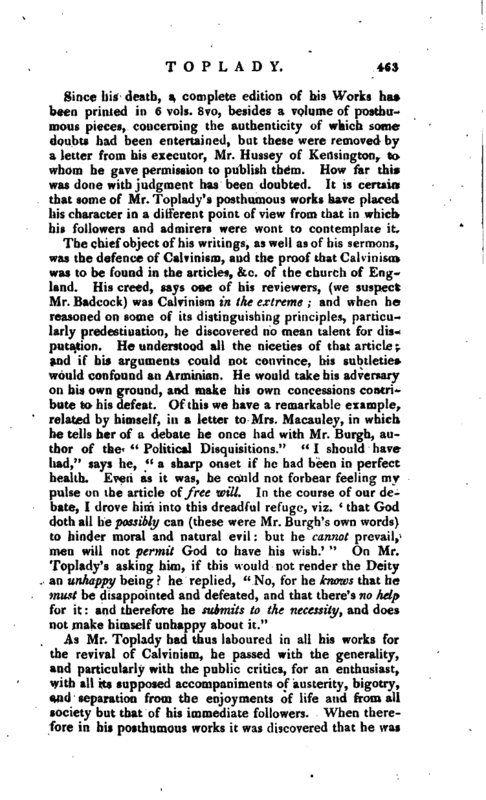 It is certain that some of Mr. Toplady’s posthumous works have placed his character in a different point of view from that in which his followers and admirers were wont to contemplate it. Life published in 1778, 8vo.—Works, passim.—Month. Rev. vol. LXX.